This gorgeous leaping hare is entirely hand made and decorated with triple moons, hearts and stars. 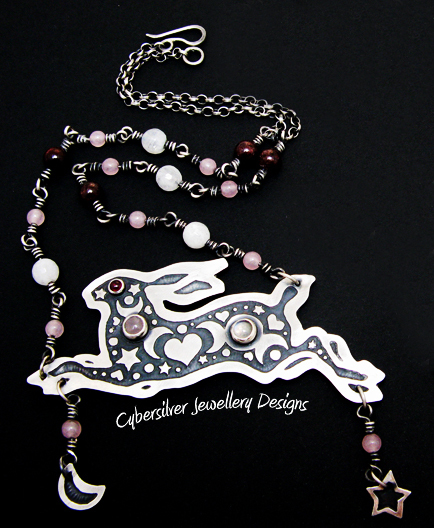 The pendant is made from thick sterling silver and set with garnet, rose quartz and blue moonstone gemstones. The silver has been oxidised and waxed to emphasise the design. Garnet, rose quartz and faceted blue moonstone gemstone beads have been used to accent the matching 17" sterling silver chain, which I have oxidised and finished with a hand-made silver clasp. The hare measures roughly 80 x 30 mm (excluding the moon and star). If you would prefer a different length of chain, just message me. Rose quartz is the stone of universal love and is often referred to as the 'Love Stone'. It is a stone of love and marriage as it helps to open the heart to love, but it also helps the wearer feel a strong sense of self-worth, or self-love. Rose quartz promotes inner healing and feelings of peace, dispelling negativity. It also helps protect against environmental pollution. Garnet revitalises, purifies and balances energy. It is known as the stone for promoting business success, and wearing Garnets can help drive out depression and boost your self-esteem. Garnet is also the stone of purity and truth as well as a symbol of love and compassion. It is also said to open the heart and bestows self-confidence. Garnet is the birthstone for January. 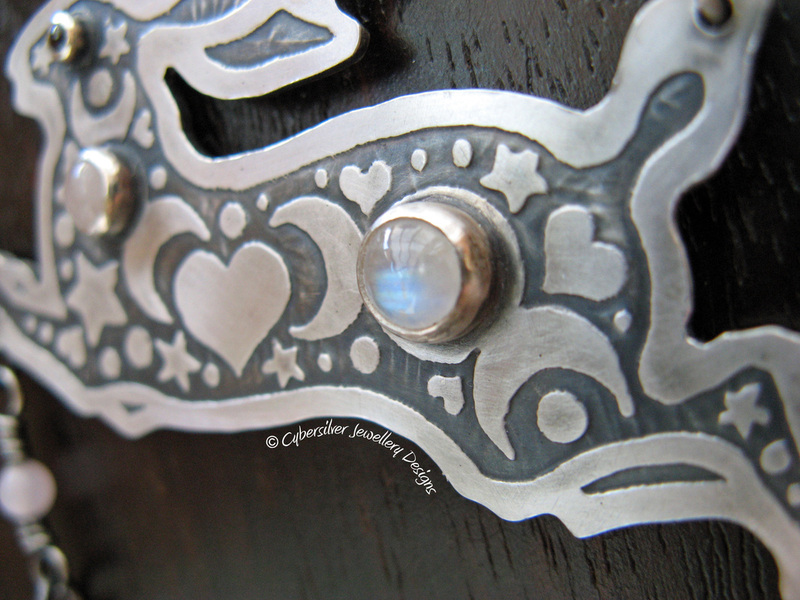 Moonstone is a stone for new beginnings - a stone of inner growth and strength. It helps to soothe emotional instability and stress and provide calmness, balance and harmony. It is a stone strongly associated with women and feminine wisdom. 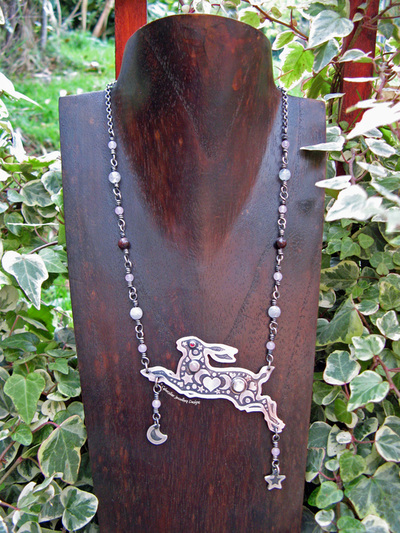 As I hand make each hare to order, please allow 3 weeks for completion of your pendant.